Which means there are a lot of moms doing their best every day to love them, care for them, and help them realize how special they really are. It's not easy sometimes but it is what some of us were called to do in this life. So, who cares for that mom when her child first gets that diagnosis? Who picks her up on those mornings when she feels like she can't get out of bed and fight the battle all over ...Click here to read this story on our Dang Chicks Nation Blog. If you are a mom of an autistic child, then you know exactly what we're talking about. Stay encouraged! You've been given a rare gift of having someone who teaches you everyday to take nothing for granted in this life. If you are lucky enough to be this mom's best friend, then you have probably learned grace beyond measure, patience you didn't know existed, a little kung fu to protect your girl, and a profound appreciation for what you have. 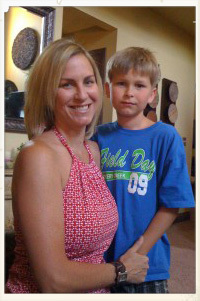 In 2003, autism became near and dear to Stephanie O'Connor, the Founder of Dang Chicks, when her oldest son was diagnosed with autism. She understands the struggles, the potential for guilt, the burden, the blessing, and the challenges that accompany this diagnosis. But she clings to the HOPE that her child will always be OK and live a long and happy life. The purpose of Dang Chicks is to remind women that they are beautiful, confident, worthy of pursuit, and good enough exactly how they were made. We know that it's all too easy for Mom's with autistic kids to put themselves last on the list of things to love every day. Wearing their heart on their sleeve while looking hot is not on top of the priority list, not to mention that there aren't a ton of options for "Autism fashion" for her to choose from. We get it, chick. Dang Chicks has teamed up with T.A.C.A. (Talk About Curing Autism) by donating a portion of the sale of all Dang Hopeful tees sold in 2014 to this wonderful organization. Help a mom of an autistic child remember that HOPE is always the word of the day! Click here to read more about the TACA and Dang Chicks program.